Today, I want to write about a potato not that we ate, but that is our (acupucturists') mate. In Japan, acupuncture students used to practice needling on various objects, such as fruits and vegetables (there is a special training called "Ukimono-do-shi" literally meaning "piercing floating objects". Especially there is a famous practice of penetrating a needle into a floating apple in an washbowl filled with water), a toilet roll, or wooden board. So, potatoes can be our good friends to practice needling with (actually, needling texture of a potato is similar to one of a human body). 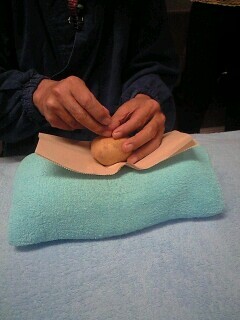 On Thursday a regular advanced class was held in Taishido acupuncture clinic, we had a needling practice on a potato for three-edged needle training. We used a kind of big needle for this practice instead of three-edged needle; trying to penetrate it deeply and remove it quickly. Some people might think that Shakuju therapy is an acupuncture methodology with soft, gentle and sensitive stimulation, but this is half right understanding. 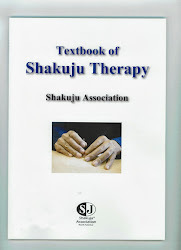 Rather, Shakuju therapy can be very soft, gentle and sensitive methodology, but can also give very strong stimulation like three-edged needle, according to the patient's condition and the therapist's skill. 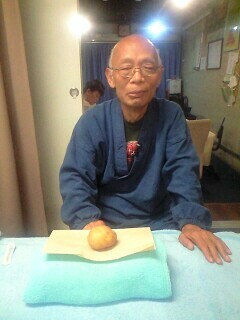 Kobayashi Sensei is always saying that because you have enough skill to be able to handle various kinds of needles* freely, from soft stimulation, such as Teishin needle, to strong stimulation, such as a three-edged needle, you can give a deep influence on patient's body with subtle stimulation. *Nowadays, Kobayashi Sensei does not use a big needle or a long needle anymore, however, before he used those needles as well. In basic course in Tokyo, we learn how to use a big needle, a long needle and moxa needle for supplemental treatment. When your needling skill is not enough, you can rely on such needles for supplemental treatment when necessary.